Photo: Circular Quay and The Rocks, where Australia began as a Nation. School Holidays: For the children, there are places in Sydney that have plenty of activities and other things to do during the School Holidays. There are beaches in Sydney that are close, such as Bondi, Bronte and Coogee as well as further north and south. 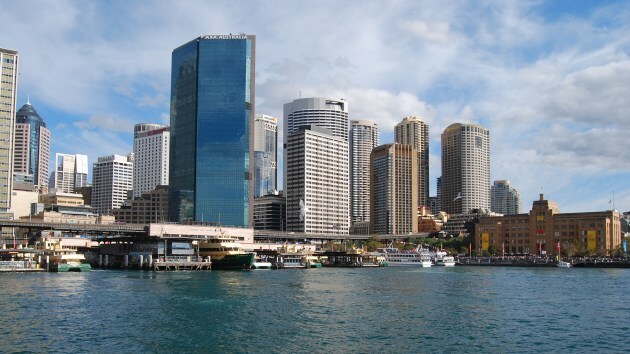 From Chinatown to Circular Quay, the Sydney CBD (Central Business District) is filled with things to do and see. If you want more, see Sydney Places to Go and Europe Places to Visit. See more about finding a great beach along the Sydney coast Sydney Beaches. There are numerous beaches in Sydney while a scenic ferry ride from the city at Circular Quay gets you to Manly Beach. The Royal National Park, history, swimming, surfing and hiking at the Cronulla Beaches. Home to the one of the world’s oldest surf life saving clubs, Bondi Beach is the closest beach to the Sydney city centre (8kms). The city’s Seaside Resort, Manly Beach. Places to Shop are ever popular, including in the city center but also in the easily accessible suburbs such as Parramatta and Chatswood. See Sydney Shopping. Take a cruise, travel to Sydney outer parts on a ferry, tour one of the many islands, or just laze on a Sydney Harbour beach. See more about Sydney Harbour Cruises, Attractions - Places to Visit. For those exploring greater Sydney, Newtown, Glebe, Paddington, Darlinghurst and Kings Cross are all suburbs close to the city and within easy reach. As the landing place of 1400 men, women and children in 1788 (over half being convicts) The Rocks provide a fascinating look at Australian history. Darling Harbour boasts some of Australia’s finest museums and entertainment facilities as well as being a well known conference and exhibition centre. Just a 10 to 15 minute walk west of the Sydney city centre. There is also a light rail service from Central Station and Haymarket, as well as the monorail operating from stations in the city. The northern region extends all the way to Manly, Pittwater, Port Hacking, Newcastle and to the wine growing region of the Hunter Valley. Known for its historic colonial buildings, Parramatta also has a number of excellent restaurants and shopping. Penrith Valley, about an hour from the Sydney city centre, is a city of open spaces and rural scenery with a stunning river and the spectacular Nepean Gorge, all at the foot of the Blue Mountains National Park. Sutherland Shire in South Sydney has the beautiful Cronulla Beaches and is close to four National Parks, yet easily accessed from Sydney City Central. On the way to Wollongong and the south coast, the South West of Sydney, also known as the Macquarie Region, has country living at Camden only some 50 kms from the city center. Campbelltown has numerous historical buildings, each with their own story to tell. Nearby outer places of interest to see, go and visit. See also Sydney Surrounds and Sydney Suburbs. The Blue Mountains offer Sydney’s most spectacular views and great walks in the bush. Within 3 hours drive, a great place for National Parks, boating, fishing and white sandy beaches - Visit the NSW Central Coast. The Hunter Valley is Australia’s oldest wine growing region. Also features some of the finest gourmet dining to be found anywhere in the state of NSW. Just north of Sydney lies the Central Coast of NSW. Although not far, it has some stunning scenery and great beaches. There are luxury resorts to caravan parks set in wonderful locations for families and everyone else who wants to escape busy Sydney. Further north from the Central Coast, if you want long pristine beaches that seem to stretch forever, crystal clear streams in lush pastures, towering forests blanketing mountain ranges - Visit the NSW North Coast. Quaint villages nested on beaches by crystal-clear waters. Enjoy the beaches and lush bushlands as well as fine gourmet dining, art galleries, craft and antique shops, fishing and sports of the South Coast. With so many tourists and business visitors coming to Sydney every year, few realise the joys of visiting the rest of this spectacular state of New South Wales NSW. 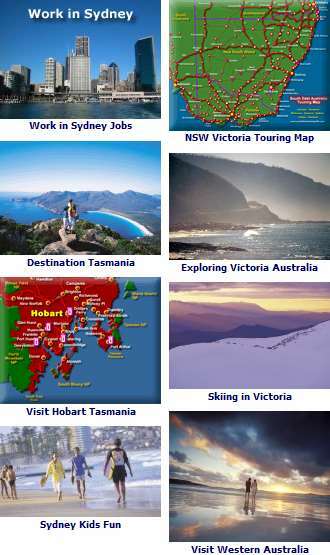 Find places of interest and popular Australia tourist destinations, hotel and other accommodation, Australia tours, packages, restaurants, shopping, attractions, museums and information about Australia. You can find world class hotels to trendy backpackers in Australia. Bed and Breakfast, holiday apartment and home rentals are becoming increasingly popular as well.